Two couples got married at the Blue Ribbon Bacon Festival in Des Moines, Iowa on Saturday. Tricia Watson and husband Tom were the first couple married at the Blue Ribbon Bacon Festival in Des Moines, Iowa on Saturday, Feb. 1, 2014. Not long after, Craig Rouch and April Davila (pictured below) got married at the same festival. 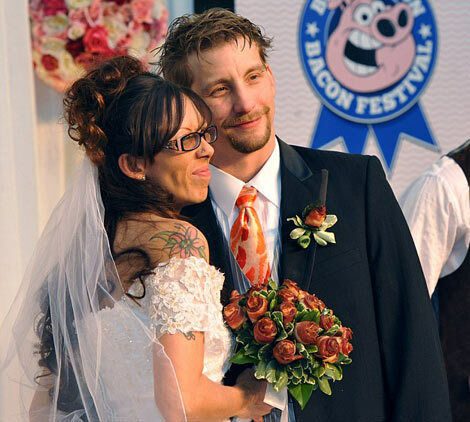 Apparently, the officiant who wed the Watsons had a bacon-themed wedding himself. “I’ve always told Trish she’s second to bacon,” says Tom. Watch scenes from the Watson’s bacon fest wedding below.